Sunday morning began as a typical day in the neighborhood– screeching rubber, scraping metal, and the clatter of a car jumping the curb. Serious traffic accidents have become all too typical along Erie Street with Sunday’s wreck only the latest on this quiet residential street in Harsimus Cove. 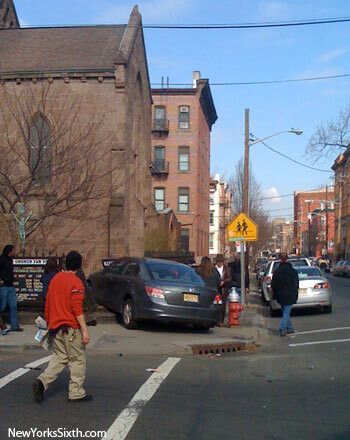 At the corner of Second and Erie Streets, two vehicles collided sending one over the curb and into the fence of Grace Van Vorst Church. Early last summer, at the very same spot, a small vehicle was spun completely around. Then there was the accident this past autumn at Third and Erie with one car jettisoned into the wall of a house. 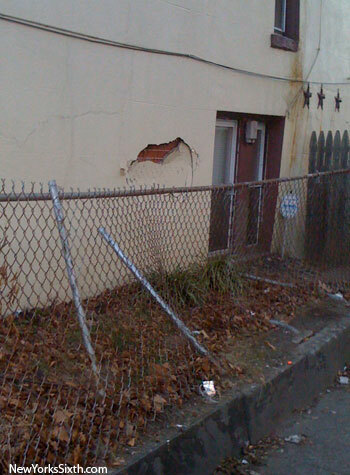 Below, the dented wall and the smashed fence on the northwest corner of Third and Erie. In the past year, we’ve personally observed four serious accidents at these two intersections alone, and its not as though we are hanging around Erie Street waiting for cars to jump curbs. The commonality between all the accidents has been a car heading north on Erie, usually speeding, colliding with a car at the cross streets. Certainly speeding drivers are largely responsible. But also at fault are cars parked to the very corner of the streets, preventing drivers on both streets from seeing on coming cars until its too late. The curbs at these intersections were at one time painted red– probably shortly after the city was founded four hundred years ago, and then forgotten about. Many of the curbs around the street corners have been replaced, and never repainted; for the rest, the paint is so faded its almost as though they were never painted at all. But repainting curb corners does not provide a long term solution. One alternative would be installation of speed bumps on Erie Street. However, speed humps spaced too far apart won’t inhibit speeding, and spaced too close together would greatly impede traffic flow. 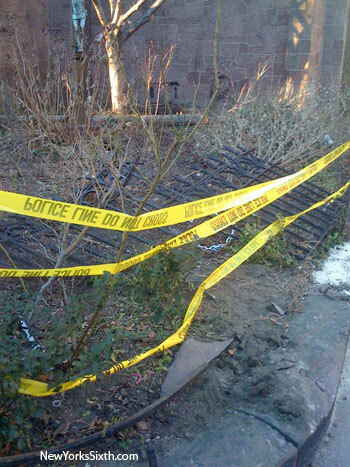 An alternative solution is construction of bulb-outs, also known as curb extensions. Curb extensions literally extend the curb and sidewalk at street corners. This is a multifaceted approach. 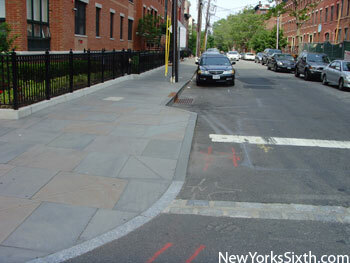 First, cars are unable to park too closely to the corner because street space becomes an elevated sidewalk. Second, drivers perceive the street as more narrow, naturally causing them to slow down. A third benefit is shortening the distance between curbs for pedestrians, though this benefit is best realized at larger avenues. Bulb outs are not unprecedented in Jersey City. Below, a small bulb out in Paulus Hook, on Morris Street. Regardless of the final solution, something needs to be done. Only coincidence has kept pedestrians out from under careening cars to date; eventually the city will be scraping bodies off the sidewalk.